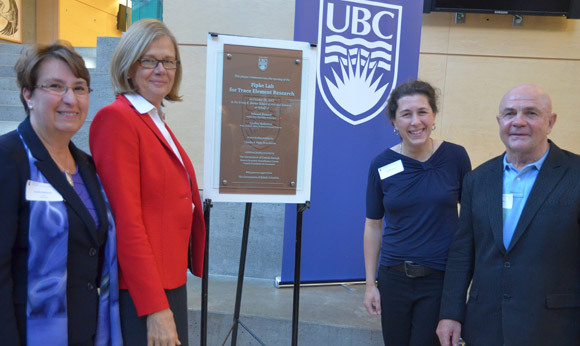 Dedication of the new Fipke Laboratory for Trace Element Research at UBC took place this week. Unveiling the plaque naming the new facility were, from left, Cynthia Mathieson, dean of the Irving K. Barber School of Arts and Sciences, Deborah Buszard, principal and deputy vice chancellor, Chantal Venturi, graduate student, and Charles E. Fipke. UBC’S Okanagan campus has officially opened a $3.5-million science lab that allows scientists to measure minute particles, scan them at the atomic level and determine their origin. The Fipke Laboratory for Trace Element Research (FiLTER), a state-of-the art interdisciplinary research facility, was formally opened with the naming dedicated to Kelowna geologist and alumnus Charles E. Fipke, whose foundation was instrumental in equipping the lab with the world-class imaging equipment. There are four high-tech instruments tucked into the lab in the Charles E. Fipke Centre for Innovative Research. One of them is the Tescan Mira 3 XMU Scanning Electron Microscope. “It lets us scan material, magnify it up to one-million times larger than the actual size, and produce a high-resolution image of the object,” says Greenough. Eagerly anticipated – but not yet arrived – is an electron microprobe featuring a high-resolution definition head so powerful it will be the first of its kind in Canada, also donated by the Charles E. Fipke Foundation. Photon Machines Analyte 193 Excimer laser – Among other functions, this basically uses a laser beam to blast solid samples into gaseous aerosols, that are fed to one of the two ICP-MSs to measure isotope ratios or determine element concentrations. Acquiring the equipment puts UBC’s Okanagan campus into the forefront of major research universities and provides capability to do contract research, as well as attract students to sciences and engineering. Among projects already under way with industry partners is an analysis of automobile wheel rims for structural integrity. The equipment has a huge role to play in geology, says Greenough. The lab can examine ore samples carried long distances by glaciers or streams and help determine where they came from. The FiLTER lab is currently doing this kind of analysis on a platinum discovery. The lab has been entirely funded by donors – led by the Charles E. Fipke Foundation and partners including Western Economic Diversification Canada, the Canada Foundation for Innovation, and the Government of British Columbia. Fipke, a pioneering geologist and UBC alumnus who was the first to discover diamonds in Canada’s north is a proud champion of UBC’s academic pursuits. Deborah Buszard, principal and deputy vice chancellor of UBC’s Okanagan campus, says establishing the FiLTER facility is an important milestone and she is grateful that Fipke and the federal government share the university’s vision. UBC is equally grateful to all of the FiLTER facility funders.